Static line skydiving and Accelerated Freefall – or AFF for short – have both taken thousands of skydivers from “whuffo” to superstar. However: the former is a rare beast indeed in the world of skydiving certification as we know it today. 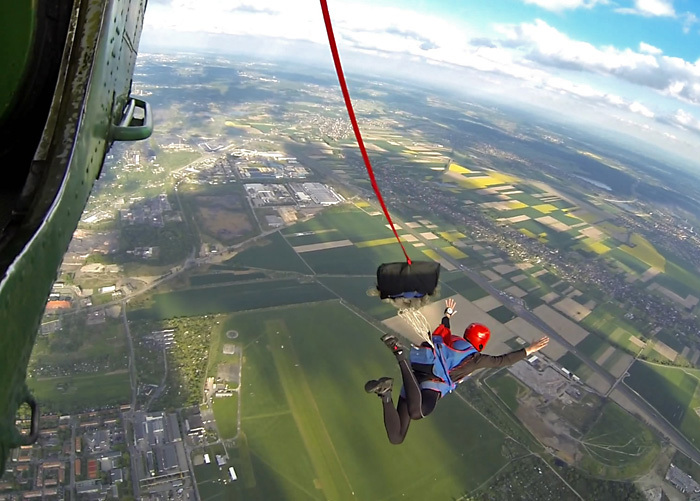 Thanks to the Accelerated Freefall learning modality (which we use here at the Wisconsin Skydiving Center), static line skydiving is for the most part a thing of the past. Ditto with the military, where the applications of freefall are pretty darned specific. Curious as to why? Let’s take a look at the differences. If you were to make a static line parachute jump for solo skydiving training, here’s how it’d go. After a thorough ground school, you’d be kitted up in solo skydiving gear (not a tandem apparatus) and loaded into a plane. There, your parachute would be connected to the aircraft in a way that deploys it when you exit. You’d be conveyed up to about 4,000 feet and coached out of the plane by a jumpmaster/instructor. As you left the plane, your parachute would open up lickety-split. You’d grab your steering toggles and maneuver yourself down to the landing area (most probably, aided by radio communications from the ground). As you progressed in your training, you’d start introducing some freefall skydiving into the equation, gradually jumping from higher and higher altitudes. In an AFF skydiving certification program, you’ll be learning how to navigate freefall from the very first jump, and jumping from standard skydiving altitude. You’ll be accompanied for your first jumps by two instructors, holding on to you from both sides for the freefall portion of the jump. You’ll have individual attention for your prep time on the ground, your ride to altitude in the plane, your freefall and your canopy flight (via radio). You’ll also get a thorough and constructive debrief afterward. This is what makes AFF so comprehensive, individual, supportive and fun. For all of the above reasons, we found that AFF helps students build their skills (and get confident) much faster than static line skydiving students. AFF students are also more likely to stay with us in the sport. In comparison, students who have just landed from a static line parachute jump tend to be a little bit discombobulated or flustered. And we get it: being ordered out of a plane and suddenly finding yourself alone under a parachute has that effect on people. 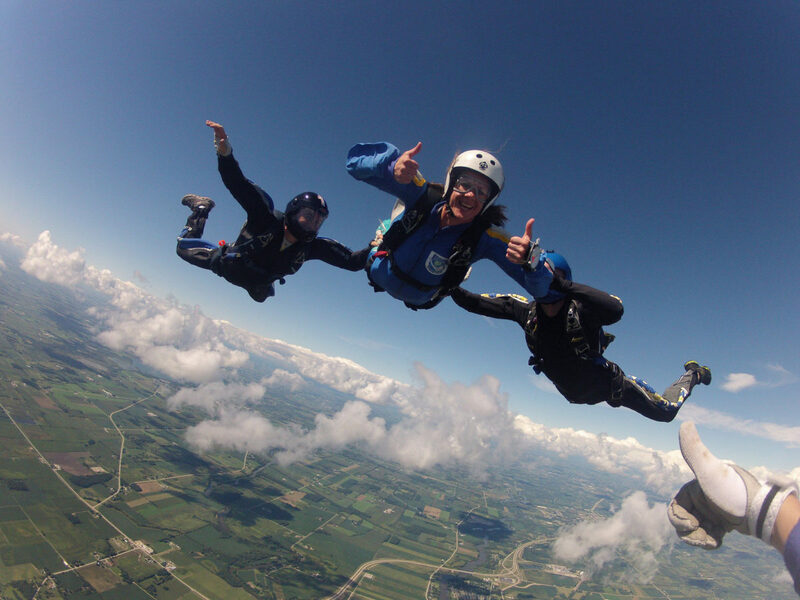 Here an AFF student enjoys free fall while jumping with her two instructors at Wisconsin Skydiving Center. 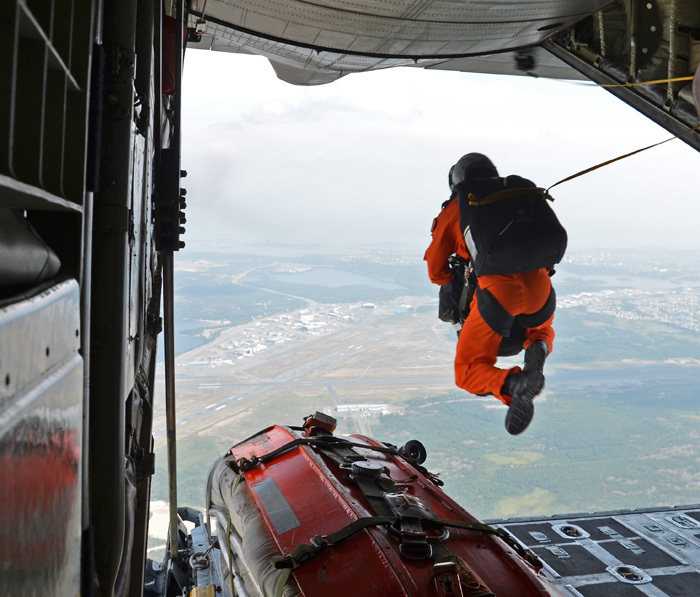 Some dropzones still use the static line progression – or its extremely close cousin, IAD (“Instructor-Assisted Deployment”) – as their training method. That’s understandable. Because there isn’t an instructor physically present with the student throughout the jump, you only need one instructor for all the students going up in a load. The plane also doesn’t go as high, so it’s a much cheaper prospect to administer a static line skydiving certification program. It’s also not as – you know – good. Dropzones which insist on offering static line and IAD programs understandably represent it as a great method. It’s hecka helpful for their bottom line, not because it’s hecka helpful for the students they’re putting through the program. The differences become really apparent once you realize that jumps in both the static line and IAD program do not count towards the minimum jumps required to earn your USPA A License. Even though it might seem cheaper and you would get to practice flying your parachute, the jumps you’d log would be wasted to the purpose of getting your solo skydiving certification. And that’s the goal, right? At the Wisconsin Skydiving Center, we take the quality and enjoyability of our students’ learning process very seriously. Static line skydiving just doesn’t allow us the one-on-one instruction that creates truly confident, well-prepared skydivers. We’re in the business of supporting our students’ growth in all the ways we can. AFF gives us the tools we need to facilitate that. For us, that’s absolutely worth the additional effort and resources that the program requires. Wouldn’t you agree? Whether you’re contemplating your first tandem skydive, or are already enamored with the sport and are considering getting some AFF training – we are here to support you. Call us or stop by the dropzone today!